come hither, and yet - stay away! A little over a year ago, I bought myself a new bike. I rode my bike all the time when I was a kid, and throughout college... but somewhere along the line, I had stopped. I really love my new bike, and I try to ride it instead of driving at least a few times a week. Lately, when I'm pedaling my way home after teaching, I have been passing this huge cactus, covered in prickly pear fruits (as seen above.) It's right there on the side of the road... huge... and looking like no one really wants these fruits at all. I started getting ideas. Now, way back when I was a wee 13 year old, I was still a frequent bike rider. My friend Vivi and I were quite inseperable back then, and we rode our bikes all over the place together. One day, we went on an ambitious ride, a little north of town, to a special state park. At the park, we saw a giant cactus - much like the one in the picture up top - covered in bright red fruits. I really don't know what got into us, but we decided to pick some of the fruits. If you have ever done this - you know what I am talking about. The green parts of the cactus have giant pokey spikes on them that are easily visible and relatively easy to avoid. The enticing little red fruits have tiny, seemingly fuzzy little spikes that are as fine as micro-hairs - but they will cover your hands and barb into your skin and set your skin on fire and you will be SAD. We were so innocent! I have such a clear memory of Vivi and I just sitting down on the path and forelornly picking these tiny, nearly invisible little barbed hairs out of hands for what felt like forever. But we still had to ride our bikes home - which involves firmly gripping with your hands... so we had no choice but to stick with it. For obvious reasons, I have been terrified of prickly pear fruits ever since that day. ...and yet, driven by a culinary curiosity, and a need for a new MoFo post - I decided to give it another go. 3. good sneakers so that no errant fuzzy poker can poke me in the foot. Isn't it beautiful? In the end, I picked about 15 small fruits or so. I picked up a lot of really nice looking fruits off the ground, because it was sorta hard to pull them off the plant with my tongs. The fruits are sort of delicate, with skin like a nectarine maybe - so gripping them with my tongs was bruising the fruit. I got a few good ones straight off the cactus though. SO! Now they are all still sitting in the paper bag - awaiting their destiny. I looked online and lots of sites suggest burning the fuzzy spikes off the fruits by holding the fruit over a burner (with tongs, of course) - so I think I will try that. Then what? Maybe I will try to make prickly pear juice. Stay tuned for part two of this exciting adventure! Do you have any prickly pear tips for me? Prickly Pear sorbet. I got nothing. i was traumatized by gingko fruit in NYC and don't pick up strange ground fruit any more. you are my total prickly pear hero! hooray! "Don't pick that prickly pear with the paw, when you pick a pear, try to use the claw"
Sorry, it's all I could think about when reading this post! 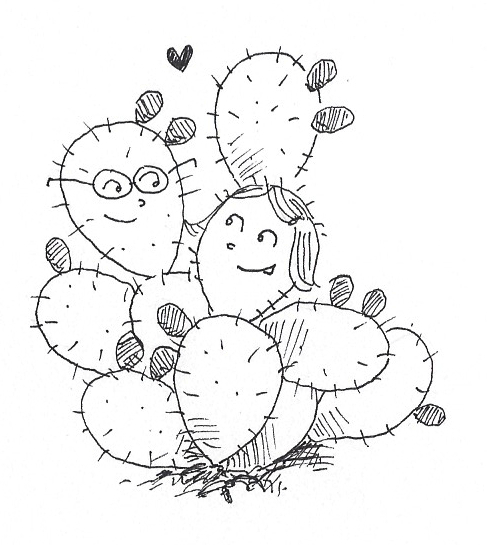 I have no helpful advice or ideas but I do love this post and your silly prickly pear adventures. I look forward to seeing what comes of it! I peel the skin, such a brilliant fuschia! and eat the insides. I've only ever bought it at that store, it's so rad you can pick your own. I'm looking forward to Part 2. 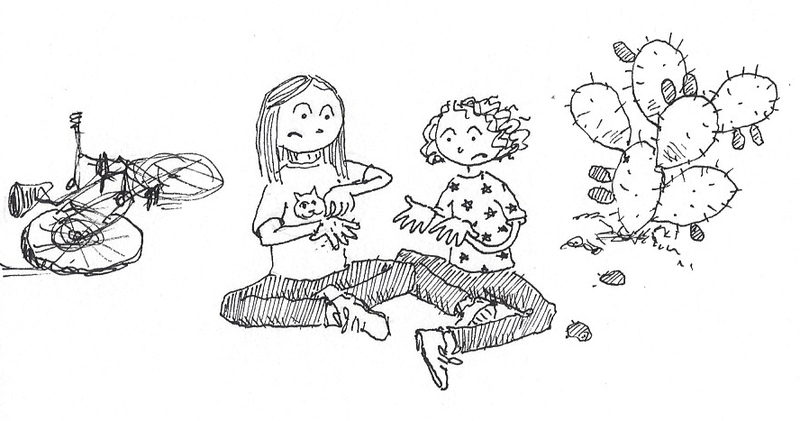 I remember my first prickly pear adventure, too; just not as exciting as yours. I learned this the hard way too. When my son was still in his jog stroller we came across some of these beauties near DeLaveaga Park. I thought it would be fun to pick them and had the same ouchy sensation you describe. It was hard to get those suckers out of my hands when I got home because they are practically invisible. My advice if you want to partake of them is to buy them from the guy at the Saturday farmer's market. I think he takes care of the issue for you. :) After tasting one at his stall I decided I wasn't even that excited about the fruit.